One of our signature profiles is the diamond, and we make it in a few different materials and types. In fact, our diamond roofing is available in steel, aluminum, copper and zinc with a variety of modifications to suit the architectural and technical requirements of our customer's application. While we're very familiar with this beautiful profile, it's considered rather unusual here in the United States. That's because most people aren't accustomed to seeing metal diamonds on roofs in this country. But from a global standpoint, diamond shaped roof shingles are actually a classic design. In fact, the shape has been made from not only metal, but also slate, asbestos and other materials for many decades. We make our diamond shingles available with a wide range of details, including the ridge, hip, drip and gable edges. While we have many standard designs for these parts, one of our favorite things is customizing things for our customers' projects. That means there are all kinds of possibilities to make any job distinctive (as these photos show). One of the most commonly asked questions about our diamonds are whether they come in individual pieces or if they are supplied as sheets. Our diamonds are individual, and all of our designs interlock on all four sides with hidden fasteners. When it comes to pricing, our metal roof diamonds aren't much more expensive than other metal roof profiles - somewhere between $2 and $5 per square foot for many of our steel and aluminum versions. 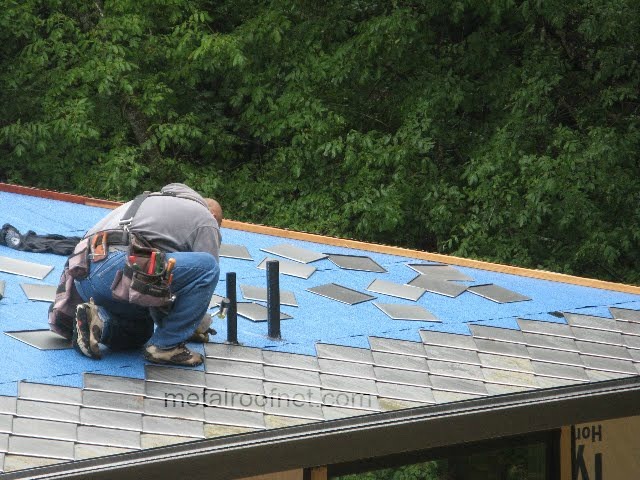 Copper and zinc prices will cost considerably more, but they are certainly competitive to what the same metal formed into more common roof shapes costs. Metal diamond roofing offers all of the benefits and advantages of metal roofing - discussed in detail in our free booklet - but in a very striking profile that will make any building stand out. 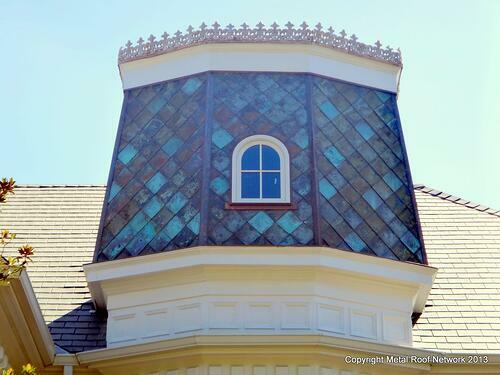 If you have a roofing project, visit our diamond diamond shingle gallery. You'll like be impressed by the aesthetic, and we'd love to answer questions about your job.